Clear, round, white cubic zirconias set in fine 14K Solid Gold with a crowning CZ center-piece. Center stone CZ diamond equivalent of approx. 1.00 carat, with approx. 1.00 carat of CZ side-stones, for a total of approx. 2.00 carat diamond eq. * Please note: sizes 12 1/2 and higher may take an additional 7-10 days to ship. 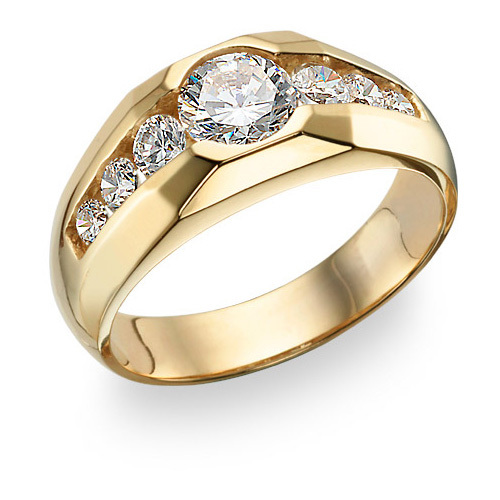 We guarantee our Men's 7 Stone CZ Ring, 14K Gold to be high quality, authentic jewelry, as described above.